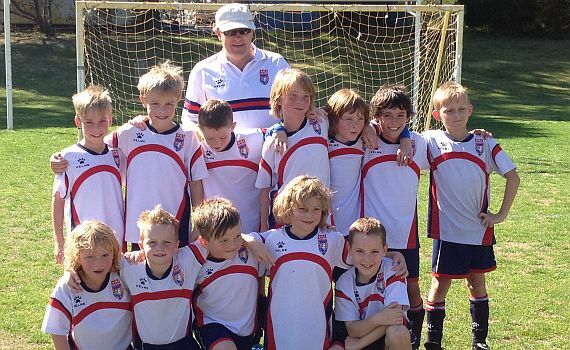 The last game of a very impressive first season for the U9’s was against a Perth team that had been strengthened since the first meeting earlier in the season. The game started with ECU playing the better football but not creating many opportunities against a defensive Perth team. The first clear opportunity fell to Perth who opened the scoring half way through the first half. ECU undeterred carried on pushing forward with Lewis, very unselfishly, slotting a nice ball from the edge of the box left to Daniel who finished clinically in the top corner. Perth then stepped up their attack with excellent defencive work from Ben, Masimo, Mathew and Euen backed up by strong midfield work from Aiden, Reegan, Blaire, Reece and Daniel. Half time 1:1. ECU starting the second half with an excellent move starting with Lewis playing the ball wide right to Joe who made a good run down the right wing and cutting back to put a low left footed cross in for Lewis to hit a first time shot, ECU 2:1. The game then became scrappy with no team settling on the ball. Harry then intercepted a clearance from the keeper and keeping his composure slotted the ball into the goal to make it 3:1 to ECU. ECU now settling back into the game, with Aiden collecting the ball from a scramble to finish well making it 4:1. Perth then tried to salvage something from the game stepped up their attack but with the solid ECU defensive work from Ben, Euan, Joe and Aiden cleaning up any chances that Perth created. ECU finished with a bit of a flurry with fancy footwork from Harry and Aiden only to be stopped by the keeper. Well done to ECU U9’s who have consistently played good football this season, well above their years, and also a big thanks to their coach Brian, it has been a pleasure to watch.